Even with rematch between Sergey Kovalev and Eleider Alvarez limited to ESPN+ subscribers, there was still enough interest in the linear televised portion of Top Rank’s “Super Saturday” card in Texas to produce favorable ratings. The February 2 edition of Top Rank on ESPN—which aired live from The Star in Frisco, Texas—generated an average of 880,000 viewers, according to Nielsen Media Research. The telecast performed at or above average in all key ratings areas, including a 0.4 share among male viewers aged 18-49 years old. Its supporting Latino platform, ESPN Deportes averaged an additional 122,000 viewers, giving the near two-hour time slot a combined total of just over 1 million viewers. Headlining the two-fight linear telecast was Oscar Valdez defending his featherweight strap for the 2nd time with a 7th round stoppage of Carmine Tommasone. The opening bout saw Ghana’s Richard Commey snatching a vacant lightweight title in a two-round destruction of Russia’s Isa Chaniev. Both platforms peaked during the latter stages of the main even. ESPN’s showing peaked at 1.022 million viewers during the 11:15pm-11:30pm ET slot, at which point the ESPN Deportes telecast peaked at 169,000 viewers. In an odd arrangement, the telecast was bookended by separate live streams on ESPN+, with another doubleheader following the linear broadcast. Headlining that portion of the show was Kovalev’s dominant, revenge-fueled 12-round win over prior conqueror Eleider Alvarez to reclaim his light heavyweight title, along with BoxingScene.com 2018 Prospect of the Year Teofimo Lopez tearing through two-time title challenger Diego Magdaleno in seven rounds. Both shows were preceded by preliminary undercard action on ESPN+, which has become standard practice for Top Rank on ESPN shows. Final figures for either live stream were not made available to the public, nor was a full breakdown of Saturday’s linear broadcast beyond the show’s overall viewership average. As for the ESPN show, Valdez’s ring return following an 11-month absence was ultimately well-received. The unbeaten titlist from Nogales, Mexico hadn’t fought since a 12-round win over former 122-pound title claimant Scott Quigg last March. That bout also aired live on ESPN, atop a telecast which averaged 1.089 million viewers. Unlike this past weekend, Valdez’s gut-check win over Quigg—in which the defending champ suffered a broken jaw—benefitted from a strong lead-in. The boxing telecast came on the tail end of all-day network coverage of NCAA college basketball conference tournaments, including the ACC Conference Championship between Virginia and North Carolina which averaged 3.435 million viewers. Saturday’s boxing card didn’t boast anywhere nearly as strong of a lead-in, with an average of 1.377 million viewers tuning in for pre-empted coverage of #4 ranked Gonzaga’s 16-point win over unranked San Diego. Commey (28-2, 25KOs) made the most of his ESPN debut, which also marked just his fifth career fight in the United States—including each of his last three starts. The streaking lightweight—who turns 32 in March—made the most of the opportunity, never allowing Chaniev into the fight in claiming a vacant 135-pound strap in explosive fashion. It will go a long way towards promoting his next ring appearance, provided he gets the all-clear from doctors examining an injurhe suffered in the brief affair. Commey is being groomed for an April 12 lightweight title unification clash with pound-for-pound entrant and two-belt lightweight titlist Vasiliy Lomachenko on an ESPN platform. However, a previously diagnosed bruised middle knuckle on his right hand now appears to be a floating tendon. As for Valdez (25-0, 20KOs), the two-time Olympian for his native Mexico entered Saturday’s bout fully healed from injuries sustained in his win over Quigg, along with a new team in his corner. The 28-year old enlisted the services of Eddy and Chepo Reynoso, best known for their work with reigning World middleweight king Saul ‘Canelo’ Alvarez. Tommasone (19-1, 5KOs) was never going to be the opponent to show the full effects of what Valdez learned from this camp. The previously unbeaten 33-year old—who was one of three pro boxers to participate in the 2016 Rio Olympics—was hopelessly outmatched, although his night ended in a much more significant accomplishment as his longtime girlfriend accepted his in-ring marriage proposal. What Valdez was able to take away from the night was that there remains significant viewing interest in his career. The show carried more than 80% of the viewing audience for his far more favorable time-slotted headliner versus Quigg last March and also a considerable improvement from his ESPN debut in Sept. ’17, when he outpointed Genesis Servania over 12 rounds atop a show which averaged 706,000 viewers. 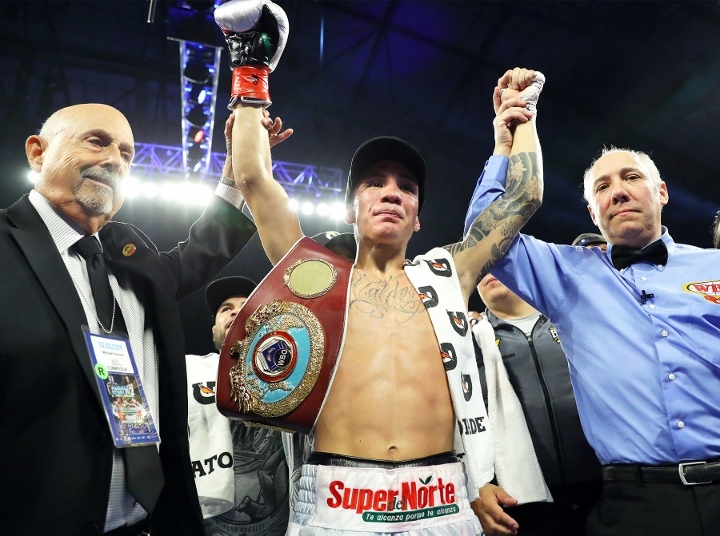 It also serves as the second most watched ESPN Deportes boxing telecast since the beginning of 2018 and the 5th best performing boxing event on ESPN over that same period.